Her international recognition infuriated the Israeli government, Ahed said. "They are afraid of the truth. If they were not wrong, they would not be afraid of the truth. They always fear the truth, they are the occupier, and we are under occupation." I am afraid for her. Ok Taking a peek dear... Yes, I noted...but to tired to read right now and wanted to get a bit of this out there...Hope you don't mind my copy/paste ~ Just a wee bit of your news @ site...Yes, you caught my interest here! "The teenage Palestinian activist Ahed Tamimi has said she used her eight months in prison as an opportunity to study international law and hopes to one day lead cases against Israel in international courts. Tamimi, who rose to global prominence as a child living under military occupation, said she and other Palestinians in her all-female prison unit would sit for hours and learn legal texts. “We managed to transform the jail into a school,” she said." I hope Ahed's actions will keep her out of harm's way and not lead to a life of harassment, arrests and imprisonment like so many other Palestinians fighting for their freedom have to endure. I know she needs to tread very careful and keep her temper in check, but she can do so much more at "liberty" tha from behind bars. Although her activism is very valuable, I do hope that she and her family decide to take advantage of one of the offers of a place at a university abroad. She'd be able to develop skills that she could then apply in Palestine, and it would also give her a time in security - but even that might have its own risks; the Israelis might well find a way to block her return. She has matured in the way she thinks. 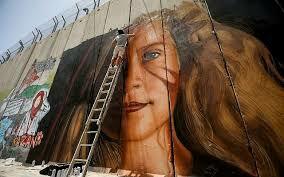 Ahed Tamimi: 'I am a freedom fighter. I will not be the victim' . Oliver Holmes and Sufian Taha in Nabi Saleh. Thank you for sharing, this update, Evelyn. Your comment makes important points. Ahed's safety is paramount, and, the Israeli state could, well, try and stop her, returning to her home and family, if she leaves. As they have with others. The Palestine Chronicle congratulates the Palestinian people and the Tamimi family on the release of teenage protest icon, Ahed Tamimi. It also reminds its readers and supporters of Palestinian rights everywhere that hundreds of Palestinian children continue to be imprisoned and are often tortured by their Israeli jailers. Also, we must all keep in mind that nearly 7,000 Palestinian prisoners are held in Israeli jails, many of whom are imprisoned without trial (the so-called ‘administrative detention’), and almost all of them go through the customary weeks of torture. According to a joint report published by B’tselem and HaMoked, Israeli forces violate Palestinian children’s rights as a matter of state policy. Indeed, prosecution of Palestinian children in Israeli military courts is systematic. Most of those children are accused of throwing stones as heavily-armed Israeli occupation soldiers. Child detention in Palestine is a “system of control”, violating the Convention on the Rights of the Child (CRC) art. 37(c); the CRC General Comment No. 10, para 89; the UN Standard Minimum Rules, rules 33 and 34; Tokyo Rules, rule 64. 60% of Palestinian children arrested by Israel were verbally, physically or psychologically tortured, according to the Palestinian Prisoners’ Club (PPC). Many of the imprisoned children are also subjected to medical negligence, as in the case of teenage boy Hassan Tamimi, who lost his eyesight, because Israel did not allow the youth access to his medication. Hassan suffers from liver and kidney issues as a result of protein malabsorption since early childhood. Ahed Tamimi Is Free, but 400 More Palestinian Children Remain in Military Jails.